When I picked up Killzone for my PS2 years back, I remembered being pretty excited to play this FPS because it looked so promising. Well after a few hours into it, I ended up trading it in at my local EB Games. My main beef with Killzone was that the controls were clunky and inaccurate and overall for an FPS the game just didn’t play well at all. I was quite disappointed. Years have gone by and Guerrilla Games has taken another shot at it with their latest instalment to the series in Killzone 2. Let me just say that they’ve come a long way since the first Killzone. 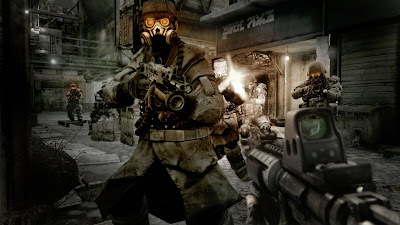 It would seem that the folks at Guerrilla listened to all the feedback generated from the original Killzone in terms of what made it a subpar game and beefed up the offering in Killzone 2. The graphics are phenomenal – probably some of the best next gen game graphics to date. The controls are responsive and accurate (some people may want to adjust the sensitivity of the X and Y axis controls to better suit their skill set using an analog stick for an FPS). The sound production is solid. And overall the game is just challenging enough to elicit a feeling of satisfaction when completing objectives (keep in mind I played the game on the Veteran level). Just a quick overview of the storyline for Killzone 2. You play as Sergeant Thomas Sevchenko and are part of the ISA forces that is retaliating against the Helghast by taking to fight to their planet of Helghan. That’s pretty much it. Nice and simple story and not overzealous in trying to make an all out war contain too much substance. With that out of the way, let’s focus on the game itself. Immediately when you start up the game you are presented with an intro in which the first 10 – 15 seconds really show off the PS3’s graphical processing power. It starts off with a complete close up of Scolar Vasari’s eye and slowly zooms out to show his entire face as he is spewing Helghan war propaganda. The detail in facial movement, texture mapping, texture surface and the lighting used was so well done that I questioned for a second if I was watching an actual actor that had been filmed for the part. As the sequence panned away further and then transitioned into the actual game, I realized it was all CG. Incredible. The entire game from that point forward is a visual buffet. Cut scenes and in game graphics are seamless and transition smoothly from one to the other much like Metal Gear Solid 4. All of the levels exude environments that are grand in scale, interactive and with intricate detail. Just spot a garbage bag lying around and break it open with your melee attack and as the garbage comes out you’ll also notice a number of bugs emerge and quickly skirmish for cover. The colour palettes used are dark tones and nicely contrasted with fiery hues to convincingly emphasize the mood of the game. Character models are all superb and what really stands out is the motion capture used to translate movement. A good example of this is when you take down a Helghast with your assault rifle and on impact you can see the various part of their body react accordingly to each hit. Another very cool movement sequence is seen when using the Bolt Gun on an enemy. When contact is made using the Bolt Gun, the enemy is sent flying off the ground and backwards a good distance. If this is done with the enemy standing in front of a wall, they actually get nailed to it. All in all, you really get a good sense for the fire power of the weapons you use as a result of the reactionary movement made on impact. Movement of your character is well balanced. When walking or turning, there is weight to it and it provides a realistic sense of the gear that you are wearing and carrying. Even better is the running. The way in which the camera bobbles up and down and from side to side actually makes you feel like you are running. It’s hard to explain in detail and is something that must be experienced while playing the game. The sound production is top notch. This game must be played in 5.1 or 7.1 surround sound to really appreciate what was done here. Particularly during a large scale battle sequence the various sound effects such as weapon fire, explosions, screaming voices and the rustling of gear as you run nicely complement the visual experience. Even during boss fights, reliance on sound is important to be able to lock in on your target effectively...especially during the final boss fight against the mighty Colonel Radec. Voice acting is very well done and never seems rehearsed or over exaggerated. The Helghast’s masked synthesized voices are quite entertaining – particularly when you throw a grenade at them and their vocal reaction to it. The musical scores within the game also do a great job in helping to set the emotional tone throughout. When playing through the game, it never seems complicated or a chore. The default control set up is laid out perfectly so that movement, attacks (firing weapons, throwing grenades or melee attacks), reloading and switching weapons is a breeze. There wasn’t one moment where I had encountered a momentary lapse in having to recall what button did what. Specifically during the many intense firefight sequences with the Helghast, where quick and unhesitant action is required do you really appreciate the ease of the controls. Overall responsiveness to the controls is tight and quite accurate. When moving the analog sticks, the character’s movement and weapon aiming is spot on. Aiming sensitivity is tied in nicely to how slowly or quickly you move the analog stick. No jerkiness here. Using the triggers to fire a weapon or melee attack comes off smoothly. My only knock here is that sometimes picking up or exchanging weapons can be delayed or missed. An additional touch is that the SIXAXIS motion controls have been incorporated into the control scheme for things such as turning wheel shaped valves or to arm and detonate explosives. This adds another dimension to the game that’s worthwhile. The list of weapons at your disposal is plenty – both your own and the Helghast. You start off the game with the ISA standard issue M82 – G assault rifle. An extremely effective weapon and more so when you zoom aim and utilize the aiming sight. Although my choice of weapon was the Helghast’s STA-52 LAR assault rifle. For me it felt more responsive and accurate when firing...not to mention that ammo for this weapon is much more available. Other notable weapons – at least to try out – include the Flamethrower, Arc Rifle, STA-3 Light Machinegun, Shotgun and definitely the Boltgun. As mentioned earlier, this game is challenging. If you’re new to FPS games, especially on a console, you’ll likely want to go through this game on the easiest setting. On the Veteran setting, the game presents just the right mix of difficulty in that you’re never disappointed in terms of ease and never really frustrated in being able to advance through the levels. Majority of the fight sequences are large in scale and very intense with waves upon waves of Helghast coming at you. Much like Call of Duty 4, there are many instances where unless you move forward to the next checkpoint, the enemy will continue to converge on you no matter how many of them you take out. So camping is not an option. The enemy AI is very adaptive and intelligent. 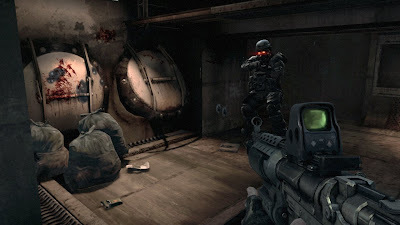 In moments where you are forced to hide behind cover, the Helghast will either throw grenades at you to force you out into the open or one or two Helghast will rush you on foot for some close range combat. Either way, you are constantly required to be alert and on your toes. Enemy AI also utilize cover very effectively and at times you have no choice to be more aggressive and confront the enemy head on. As mentioned, there is a cover system present and it is integral to the gameplay as you’ll find that you’ll be using it through most of the game. The cover systems works very well in that you can hide behind all types of structures and make use of much of the game’s environment. You can also peek above or to the sides for added variety in how you emerge to fire your weapon. Not that the superb single player experience wasn’t enough, you also have a fantastic multiplayer mode to check out. Guerrilla did a great job in creating a multiplayer experience that is a lot of fun and offers variety. One of the most important things for a successful multiplayer is the maps and the ones in Killzone 2 are well designed in both layout and size. The inclusion of multi-levelled buildings, bridges and sub-level structures provide a maze like playing field and as such the need for effective team work is essential. The innovative part of the multiplayer is in the game modes and how they are presented. Online matches consist of a single game in which multiple modes or types are played. These modes include Assassination, Search & Destroy, Search & Retrieve, Bodycount and Capture & Hold. At the end, the team that have won majority of the game modes/types wins the overall game. This is a nice touch that provides different flavours of action all seamlessly and within one session. Levelling up based on a win and as well as your own personal stats during the game can be fairly quick and as such keeps you coming back for more to get to the next rank. The other component that brings variety and strategy to team based play is the ability select a specific class of character. Each class of character brings a specialized skill set that is useful in battle – for example the medic which can revive fallen comrades before they completely die. Multiplayer supports 2 – 32 players and players can be grouped into squads of 4. There is also a clan feature where players can form clans to complete in tournament style matches that can be scheduled via Killzone.com. Similar to Gears 2, there is also an offline multiplayer mode where you can battle against AI “bots”. 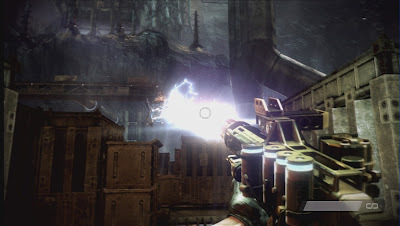 Killzone 2 is a next gen masterpiece that sets the bar high for a console FPS. Every facet of the game is impressive and executed extremely well. As such, it begs the question of how Guerrilla can possibly top this effort for the next iteration of the series (the game’s ending no doubt indicates a part 3 to come). Stunning graphics, fantastic sound production, challenging and rich gameplay and various innovative features all make for a game that must be experienced. Although, I will say that I am somewhat disappointed that co-op play wasn't incorporated. Especially seening as how fun this game is, the ability to play through it with a friend would have increased the fun factor tenfold. Only a minor knock. That said, I would put this game easily as a top 10 for 2009 and likely a very strong contender for game of the year.